I was in search for inspiration for a fall apple dish and thought of my Mom. Growing up, my Mom would make baked apples for dessert quite often. She would slice the apples up and toss them with maple syrup, vanilla, and tons of cinnamon. They are simple, delicious, and a much healthier option than most desserts out there. However, I wanted to add a little crunch to the apples. So I candied pecans, Mom’s favorite, to sprinkle over the top. The result was better than I could have imagined. The pecans took it to the next level. 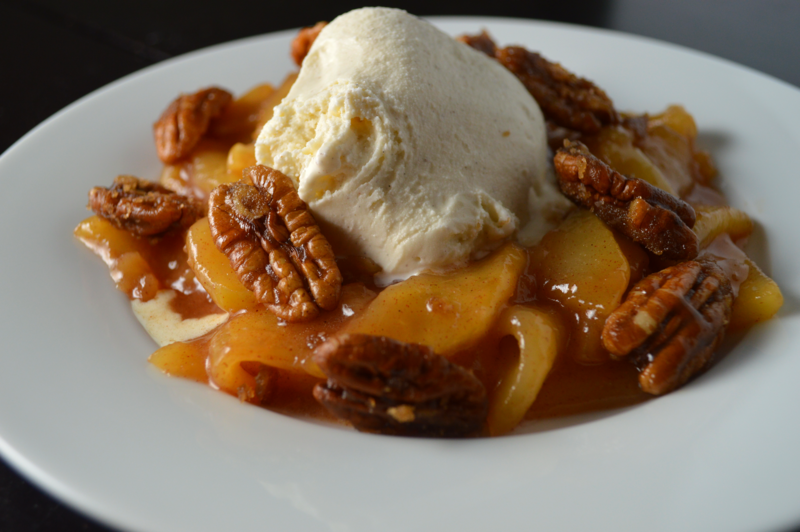 This is a quick, simple, slightly healthier, fall dessert to utilize all of those beautiful apples in season right now. This recipe makes enough for two generous servings with some extra pecans leftover to snack on. Toss the apples with cornstarch. Then add the rest of the apple ingredients and toss to coat. You can divide the apples into individual dishes or bake them together in a small baking dish. Top the apples with a tablespoon of butter dabbed evenly over the top. Bake for 30 minutes or until the apples are tender and the sauce has thickened slightly. In a saucepan over medium , heat the butter, sugar, salt, and cinnamon until nicely melted. Make sure not to burn the sugar. Once melted, add the pecans and stir to coat. Add the vanilla at the very end, stir, and spread onto a parchment or silpat lined baking sheet. Allow the pecans to cool before serving. 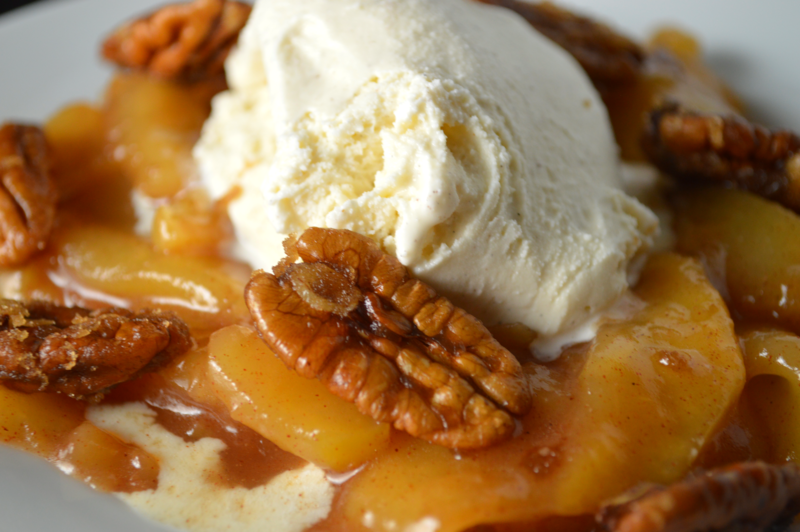 Apples + french vanilla ice cream + candied pecans = dessert heaven. Thanks Mary! It’s such a simple dessert, but so comforting and delicious! Oh good lord that looks Divine! !